Herbs , to 4.5 dm. Stems covered with persistent petiole bases. Leaves: stipules persistent; petiole 8-25 cm. Leaf blade oblong-ovate, deltate-ovate, or orbiculate, entire or deeply pinnately lobed, 6-20 × 7-22 cm, pubescent. Inflorescences: peduncle 7-25 cm; receptacle flat, curved, or undulate, quadrangular or lobed, to 3.5 cm square. Drupes somewhat globose. Seeds yellowish, explosively expelled. 2 n = 30. Flowering all year. 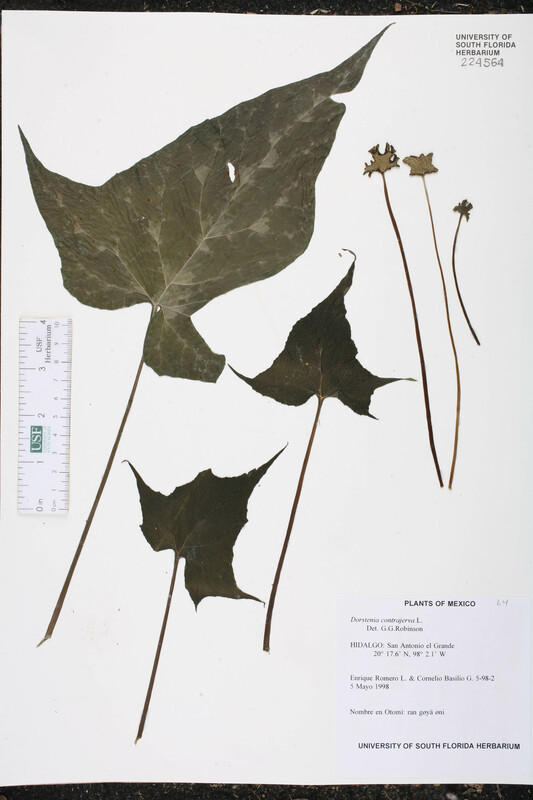 Moist, disturbed sites; 0-20 m; introduced; Fla.; s Mexico; Central America; n South America. Dorstenia contrajerva is a weed in greenhouses and nurseries; it rarely occurs in the wild in North America. It is sometimes cultivated as a house plant.